The next-generation professional two-way radio communications solution is here, with more performance, productivity and value—thanks to digital technology that delivers increased capacity and spectrum efficiency, integrated data communications and enhanced voice communications. MOTOTRBO is ideal for professional organizations that need a customizable, business-critical communication solution using licensed spectrum. 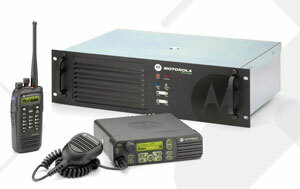 MOTOTRBO is changing the way businesses communicate. You can gain the productivity of powerful data applications such as MOTOTRBO Location Services and Text Messaging Services now. And with additional applications coming from Motorola's Application Developer Program, you'll be able to leverage ongoing new capabilities—and get the most from your communications investment. The MOTOTRBO Text Messaging Services allows communication between radios and dispatch systems, between radios and email-addressable devices, and to remote PC clients attached to radios. This application allows you to utilize another form of communication for your business—whether its the need for discreet communication or the ability to send quick text messages. Thus enabling you to focus on the business at hand. Furthermore, the dispatcher PC can act as a gateway to email, enabling messaging between email-addressable devices and radios.